Diana Del Pilar, left, was named Principal of Rose Avalos Pathway in Technology Early College High School during the Jan. 15 Aldine ISD Board of Trustees meeting. 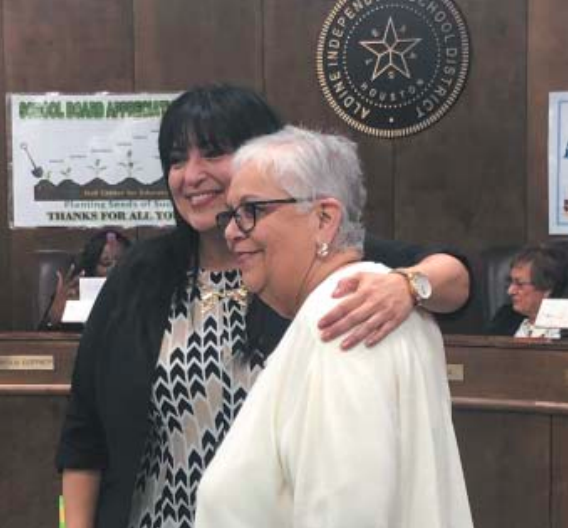 She is pictured with the school’s namesake, and AISD Trustee, Rose Avalos. Diana Del Pilar, a MacArthur High School graduate, is coming home. Del Pilar was named the principal of Rose Avalos Pathway in Technology Early College High School at the Jan. 15 Board meeting. She will assume her new duties on Feb. 4. She brings nearly 20 years of experience in the field of education to the role which includes more than 10 years in Aldine, and four years as principal of Houston ISD’s Middle College High School-Gulfton. The Sam Houston University graduate began her teaching career in 1999 as bilingual teacher at Aldine ISD’s Sammons Elementary School. She also taught bilingual education at Hill, Wilson and Stehlik Intermediate schools before moving to Goodman Elementary where she served as the school’s bilingual instructional specialist. In 2005, she moved to Spring Branch ISD and served as an instructional specialist at Treasure Forest Elementary School before becoming an assistant principal at that same campus. In 2011, she moved to Houston ISD to serve as the principal of Helms Elementary School before opening the Middle College. That experience will immediately be put to use as Del Pilar will lead recruitment efforts Aldine’s district’s first P-Tech high school and 10th high school. Avalos PTECHS will open in August of 2019 and is the final school built with funds from the $798 million 2015 bond referendum. The campus is designed to offer smaller class sizes, supportive personalized learning environment while students are earning a high school diploma, an associate’s degree, or a two-year post secondary industry certification through internships, apprenticeships and other job training programs. Avalos PTECHS is a partnership between Aldine ISD, BakerRipley and Lone Star College. The campus is named after Aldine ISD Trustee Rose Avalos who has served on the Board since 2006.